Horncastle Arena (formerly known as CBS). Travel by bus. (There is a video of the choreography by Koffie on the choir backstage). Check it out. – The Concerts start at 7pm, and will be finished between 9 and 9.30, possibly even earlier on the Tuesday. – Tickets are now available on dashtickets.co.nz and are $12.50 including booking fee per person.There will be door sales, but due to the limited number of seating available, we strongly recommend you encourage your families to purchase theirs in advance. 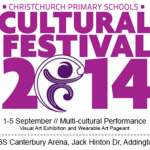 ChCh Music festival area (blue book) rehearsal at Shirley Boys. Travel by bus. August 9, 2014 in Not for Front Page.